Fine art, Illustration, graphic design and the art philanthropy of Sam Morrison: Oh the Temptation!!! 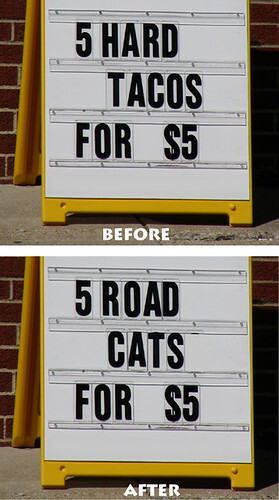 If you scramble the letters of HARD TACOS you can actually spell ROAD CATS... (with only the "H" left over). I have to admit, I am SO TEMPTED to actually change the signage. Unfortunately, I'm not gutsy enough to pull it off. So I Photoshopped it instead.